Stade Tourbillon is a multi-purpose football stadium located in the small, 31,207 populated city of Sion, Switzerland. 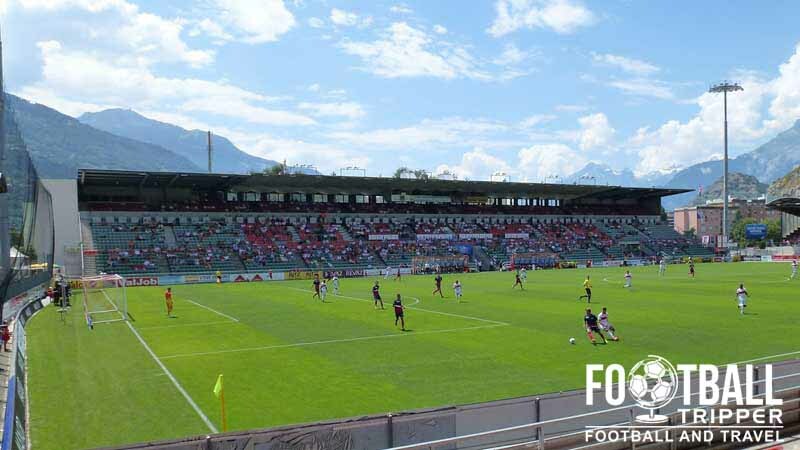 Home to local Swiss Super League side FC Sion, the ground first opened in 1968 and underwent significant renovations in 1989 to bring it up to its current capacity of 16,263. 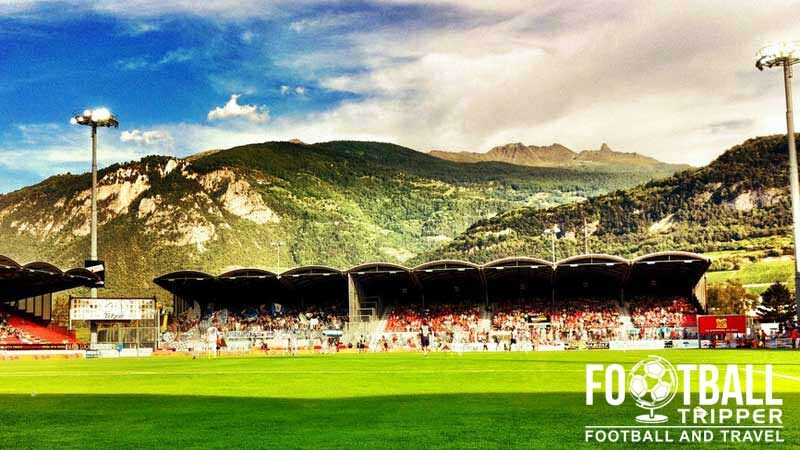 Stade Tourbillon is the fourth permanent home of FC Sion since the club formed back in 1909 with the club starting out playing football on a plot of spare land next to a gas plant before slowly upgrading their facilities as they moved around town. Between 1928-1968, the club resides at Parc des Sports Tourbillon which was their second most long serving stadium before moving to today’s Stade de Tourbillon. First opened on the 11th August 1968, the ground took it’s name from the nearby Château de Tourbillon which is a medieval castle overlooking the city high up on the surrounding hills. Unlike this historic monument, Stade de Tourbillon has been renovated over the years since opening with the most significant renovation coming in 1989. This year saw the addition of roofs across all four stands, and it helped set the tone of future developments which occurred over the next 20 years including the expansion of matchday hospitality facilities for both supporters, the press, officials and players. The ground originally opened with a capacity of just over 20,000 but most stands were converted fully to seating after enhanced UEFA regulations which resulted in the capacity being reduced to an estimated 14,283. FC Sion’s stadium has hosted a handful of International matches through the course of its history including friendly matches against the now dissolved Czechoslovakia in 1985, the United Arab Emirates in 1994 and most recently Costa Rica on the 1st of June 2010 in a warm up match for Euro 2012 qualifiers. Stade de Tourbillon is comprised of four stands: North, East, South and West. 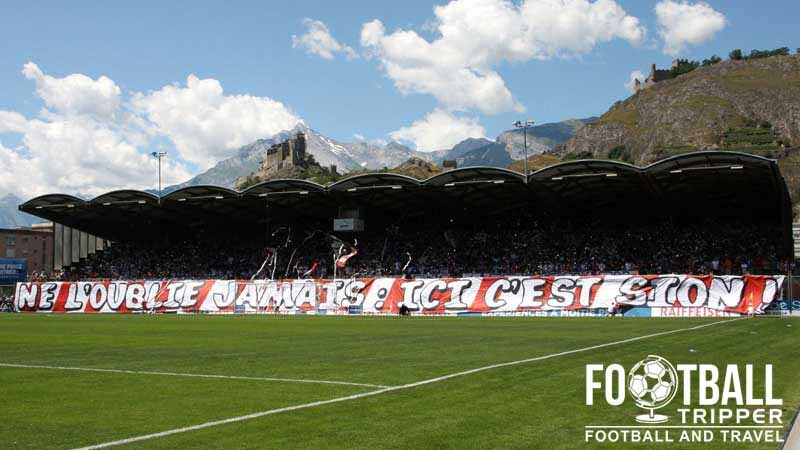 Situated within the Swiss area of Rhône, the town of Sion is very close to Sepp Blatter’s hometown of Visp. Instead of sharing any affinity with the Fifa overlord however, Blatter was duly heckled by supporters of FC Sion back in January 2012. Whether or not this act of defiance is what inspired Milan’s Gennaro Gattuso to sign on a free transfer remains to be seen, however based on this incident alone the supporters of FC Sion are more than a decent bunch! Having secured qualification to the group stages of the Europa League for the 2015/2016 season after lifting the Swiss Cup, it will be great to see what the white and red team can do in Europe after losing to Celtic in the play-off round back in the 2011/2012 season. A section of FC Sion supporters travelling to an away match as recognisable by their classic red and white colours. Away fans are housed within the south-east corner of Stade Tourbillon within what is effectively block D4. Based on the pattern of the roof one can deduce that the visitors sections takes up exactly 37.5% of the southern goal-end, and thus you’re probably looking at a few hundred tickets maximum. Unless you’re visiting Stade Tourbillon on a matchday, you’re best bet when purchasing merchandise of FC sion is to try the official online store. Unfortunately there are no stadium tours currently available of Stade Tourbillon, but if FC Sion ever change this situation we’ll be the first to update this page. Tickets to see FC Sion in action can be purchases by phoning 0900/800 800 (charges apply), visiting the official website, or by visiting Ticketcorner points at Swiss Post, Man and SBB Stations around the city. Note: Tickets are generally more expensive the more central you go when it comes to the east and west tribunes. The best atmosphere is usually in the Tribune Nord, and you have the added bonus of it also being the cheapest! 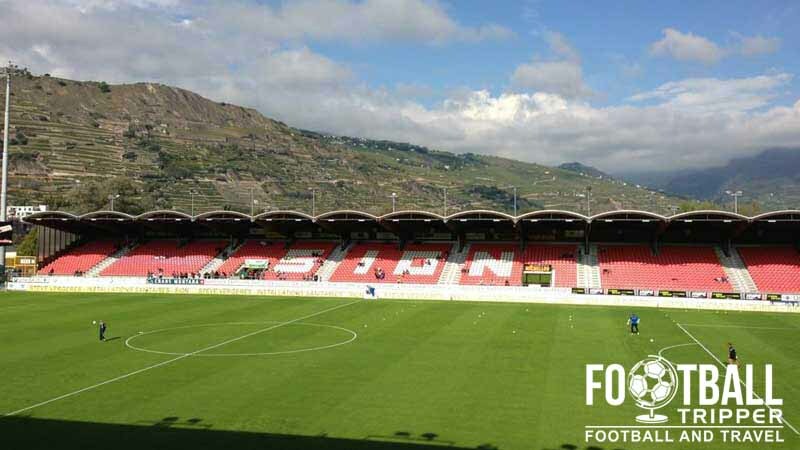 Stade de Tourbillon is located less than no more than 1.7km east of Sion’s historic city centre which means you can feasible walk to the ground in approximately 20 minutes on a matchday. Sion Railway Station sits right on the line between Lausanne and Geneva which means that it is well connected to the rest of the Switzerland. As it is in the centre of town the previous information regrading walking times of around 20-25 minutes holds true. There is a small carpark located behind the back of the north stand and reportedly signs around the stadium which can direct you to the nearest carpark. As Sion is relatively small don’t be afraid to park slightly further away and walk the distance. The exterior of Sion’s railway station. Sion Airport (Aéroport de Sion) is located 2.5km southest of the city centre, however it doesn’t have the largest amount of International flights routes with only Air Glaciers and Intersky reportedly operating regular services out of Sion. Therefore Geneva International Airport which is 110 km to the west becomes the default airport hub for large parts of Western Switzerland includine the Rhone Valley. East of the stadium Tourbillon on Route de Chippis there is the out of town Hotel Ibis Sion Est otherwise your accommodation options are back towards the centre of town. Generally speaking quite expensive Jugendherberge Sion just past the railway station appears to be one of the more reasonable priced hotels.